Way to go Ellie! I saw you come in at Michigan Bluff (I was sharing shade with your crew) and knew you'd come back strong. Huge congrats and good job not getting mauled by a bear :) Enjoy your well deserved recovery! Congrats Ellie! Loved reading your recap. What an accomplishment! Great recap Ellie! Very inspiring and awesome comeback story, and loved the bear part, to boot, (though I'm sure you thought at the time you could do without that!) Ha ha! Congrats again - this is your year for sure!! Congrats Ellie! I was working the Foresthill aid station when you came thru...you wouldn't have known you were having a rough day up to that point. Fantastic finish and recap. You are amazing! What an amazing race, Ellie. You experienced all the ups and downs and persevered. Thanks for sharing your story. Cheers! That was a very polite way of saying "I dropped my pacer at Browns Bar." :) Awesome recap of an epic first 100! It was so much fun to crew for you Ellie! What an inspiration to us all! Congrats again on a fabulous race! Huge congratulations to you and your crew. What an amazing race to come back and finish so strong. Loved the report. Recover well. As everyone says, the 100 Mile is a different beast than the shorter ultras, but you made that look easy, too - Congrats! Hefty at 127? Girl you are tiny! You are so inspiring! Congratulations! What a day and what a win! There's nothing like a little drama right 'til the finish line. Congrats on winning Western frickin' States Ms. Ellie! Awesome job Ellie! I was keeping check on the race from the UK and was made up when you came in first. Pure class! Congrats on the sweet WS victory!! What an incredible finish. I was that guy hiking to Michigan Bluff with you & also the same guy yelling and screaming at mama bear and her cub :)). I loved how you kept yelling and whistling all the way up to Robie. Hope to see you next year. 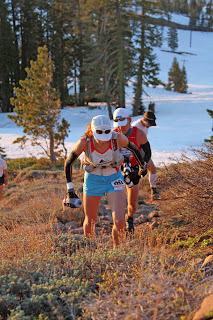 What a great race recap to read - inspirational! Congrats on the win!